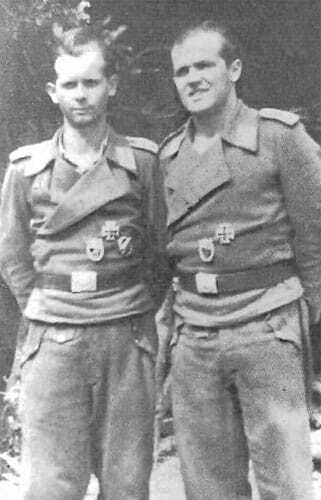 Two members of an StuG crew of Luftwaffe paratrooper volunteers ‘Sturmartillerie-Brigade 12’, who distinguished themselves in the battle against Allied armour in the Reichswald. Both have the Iron Cross 1st Class and the Luftwaffe Ground Combat Badge. Canadians advance into Reichswald southeast of Nijmegen, between Maas and Rhine (Operation Veritable).